Because both Virginia and Maryland are relatively small states that share borders, visitors to the region who love live theater can travel to either state to enjoy some high-quality entertainment and a meal all at once at a variety of different venues. Dinner theaters provide a fun evening of entertainment at a fraction of the cost of professional theatrical performances as well as an ideal setting for a group gathering of all ages. Both Maryland and Virginia offer a number of establishments that offer this type of theatrical entertainment. From Medieval Times in Maryland to the Riverside Center in Virginia, explore some of these great options and plan your trip to the central east coast of the United States—just make sure to book your tickets in advance, especially if you plan to travel with a large group. Maryland is full of fantastic opportunities to see some high-quality performances while enjoying a meal with your friends or family members, but the most popular and universally known of these is Medieval Times. Located in Hanover, Maryland, Medieval Times takes guests on a journey through a performance of knights and castles of the 11th century. The two-hour tournament includes a four-course, utensil-free meal, jousting, swordsmanship, thrilling hand-to-hand combat, and displays of extraordinary horsemanship and falconry as part of an exciting yet touching story set in medieval Spain. There is also a bar, dance floor, hall of arms displaying medieval artifacts, and a medieval torture museum. Toby’s Dinner Theatre is a great dinner theater located in Columbia, Maryland. The dinner theater offers Broadway and original musicals with a live orchestra, buffet-style dinner, and performances in-the-round, providing an interactive experience and a good seat for most viewers for either the evening or matinee performances. Toby's Dinner Theatre has been entertaining the community for more than 35 years and has had over 70 Helen Hayes Award nominations. Past shows have included "Show Boat," "A Christmas Carol," "Sister Act," "Hairspray," "Peter Pan," "Ragtime," "It's a Wonderful Life," "Cats," and many more. 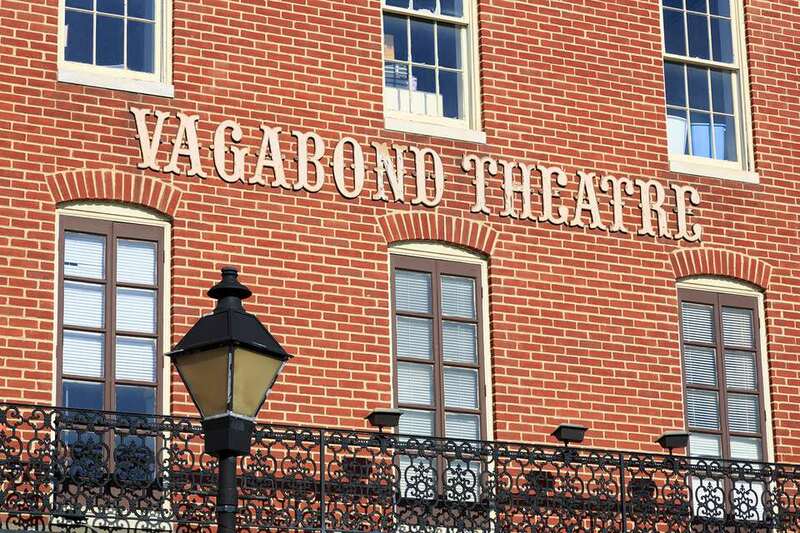 The Way Off Broadway Dinner Theatre in Frederick, Maryland offers guests dinner theater with live performances and fine dining as well as children's shows, theater classes, and summer camp programs. Past shows have included "The King & I," "Guys & Dolls," "Grease," "Fiddler on the Roof," "A Chorus Line," "The Sound of Music," "Evita," "Cats," "The Full Monty," "South Pacific," "Hairspray," and more. The Washington County Playhouse offers an intimate dinner theater and children's theater experience. The buffet dinner has a lot of a variety that you should find something to your liking. You'll find that some of the actors you will see on stage double as your servers. There is not a bad seat in the house and you will not be far from the stage. Shows have included "Grease," "The Wizard of Oz," "Sweeny Todd, The Demon Barber of Fleet Street," and many more. Virginia is also home to a number of nationally-accredited dinner theater companies. For a more modern endeavor, consider heading to Fredericksburg, Virginia, where the Riverside Center presents dinner theater performances of Broadway musical productions with evening performances held Thursday through Saturday and matinee performances held Wednesdays and Sundays. Past shows have included "The Wedding Singer," "My Fair Lady," "Mame," "Sister Act," "West Side Story," "Les Misérables," "White Christmas," "Ain't Misbehavin'," "The Sound of Music," and more. More Entertainment in Washington, D.C. Nearby, the capital region of Washington, D.C. is also a great place to enjoy live entertainment. If you plan to venture on to the nation's capital for some live entertainment, check out this guide that can give you information on venues for plays, music, and dance.